Important Notice: Lithium-Ion Item - Express Delivery option not available due to transportation regulations.The all electric operation of the Greenworks' line of tools provides not only reliable performance and dependability, but also offer a clean running alternative to gas powered tools as well. 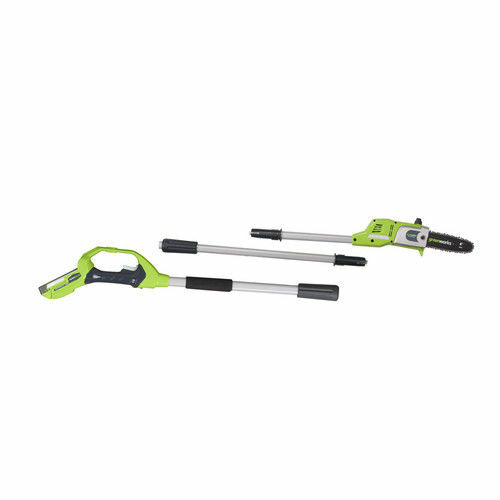 Each Greenworks' tool comes with a variety of performance and safety features that not only help you get the job done right, they also promise carbon emission free operation for a cleaner environment.Trimming out of reach branches is now not only easier to do, but is now also environmentally friendly with Greenworks' 20352 24V Cordless Lithium-Ion Enhanced 8 in. Pole Saw Kit. Powered by advanced Lithium-Ion batteries, the 20352 provides powerful cutting performance without being tied down by cords or being bogged down by gas. Its 14 in. cutting capacity makes it easy to trim and clean up branches, plants and more with ease, and easily detaches into 3 segments for storage and transportation. Powerful 24V motor delivers dependable cutting performance.. Versatile 14 in. cutting capacity.. Sturdy 8 in. bar and chain deliver reliable cutting power.. Tool-less chain tension adjustment system with quick adjustment knob.. Rear handle lock-off switch prevents accidental start-ups.. Over-molded handle for increased user comfort.. Auto-oiler with clear-view window for easy oil level checks.. Excellent tool for the price. Plenty of power and the fully charged battery lasted about an hour which I think is great. The automatic oiler for the chain is a plus and the trigger safety feature is a plus also. Has good balance and easy to use.